Kundalini Yoga, Meditation and Mantras with Live Music Workshop. Amplify your connection to your infinite self. Activate the power of the Mantras. Merge into the feeling of infinity. Speak your self into the world to create trust, and build strong relationships. This Kundalini Yoga experience will impact your consciousness forever. It’s about connecting to the sound of consciousness that allows all other sounds to be. 45€. Practice guided by Celine Flash Lakshmi Pritam and Camille Param Devi. 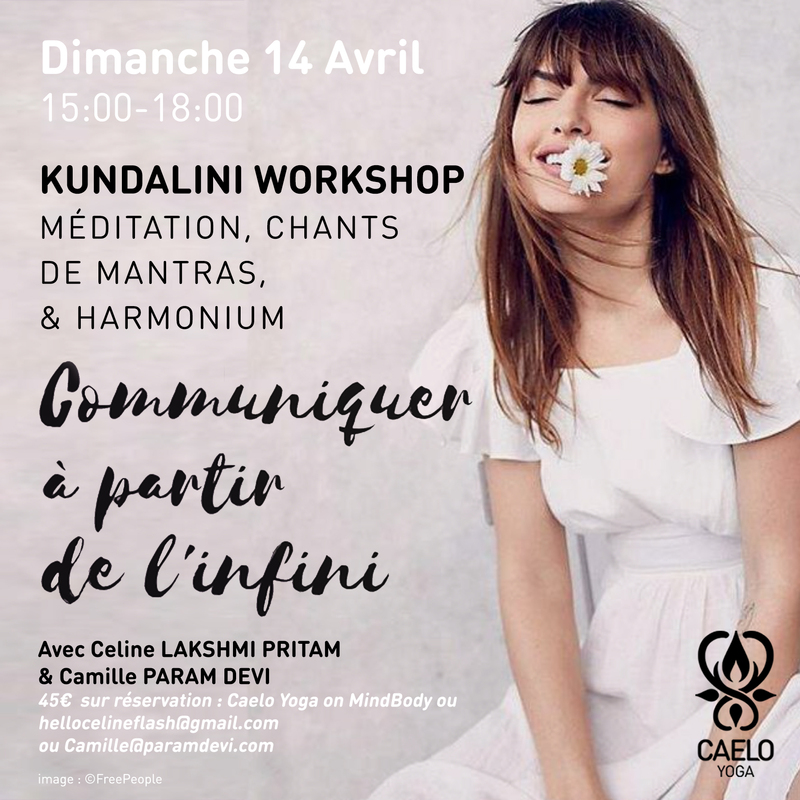 Workshop Kundalini Yoga, Meditation et Mantras avec Musique Live. COMMUNIQUER A PARTIR DE L’INFINI. Amplifier sa connection avec son Soi infini. Activer le pouvoir des mantras. Sentir les vibrations de l’univers. Activer ses vibrations de l’intérieur pour s’exprimer avec confiance, et construire des relations solides. Se connecter au son de l’univers et de la conscience infinie. Cette expérience de yoga kundalini vous permettra de réécrire la mémoire de vos cellules. 45€. Pratique guidée par Celine Flash Lakshmi Pritam et Camille Param Devi.